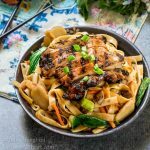 This delicious recipe was first published on 3/14/16 and has been updated to improve the reader experience. 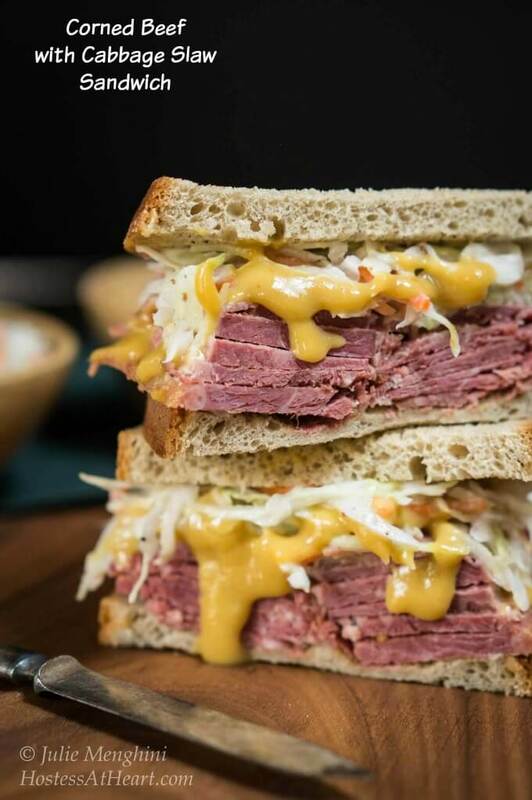 Corned Beef Cabbage Slaw Sandwich is not an ordinary sandwich! Leftover Corned Beef? What was I thinking? I bought the biggest corned beef brisket that I could find, and there are only two of us? Well, I did it on purpose. I only cook corned beef once a year and don’t know why. It makes the best leftovers. We really look forward to corned beef and the leftovers are a delicious benefit. My mother-in-law always bought a few extra when they went on sale and stuck them in the freezer. If you like this recipe leave me a comment and a 5-star rating! I’ve got to do that this year too so we can make more of these sandwiches which are slathered with a mild brown sugar mustard sauce that just seeps into this sandwich and guarantees that every bite is going to be flavorful. It’s topped with a creamy caraway slaw that is smooth and adds another layer of flavor binding everything together. Do the Irish celebrate St. Patricks Day? Until the 1970s, St. Patrick’s Day was a religious celebration in Ireland, and the pubs in the country were closed. Do the Irish eat corned beef and cabbage on St Patrick’s Day? Truth be told, corned beef and cabbage is about as Irish as a McDonald’s Shamrock Shake. Back in the day, people in Ireland would have celebrated the feast day with a meal of Irish stew and soda bread, or maybe a meal of pork and potatoes, which was inexpensive. I found a lot of fun facts about St. Patricks day from this article. I really enjoyed reading up on St. Patricks Day. If that’s not your thing just scroll down for the recipe! We really look forward to corned beef and cabbage, and usually, just make sandwiches with the leftovers. They were just sandwiches that is until this Corned Beef Sandwich recipe. What else can I serve with Corned Beef? What else can I make with Corned Beef Leftovers? 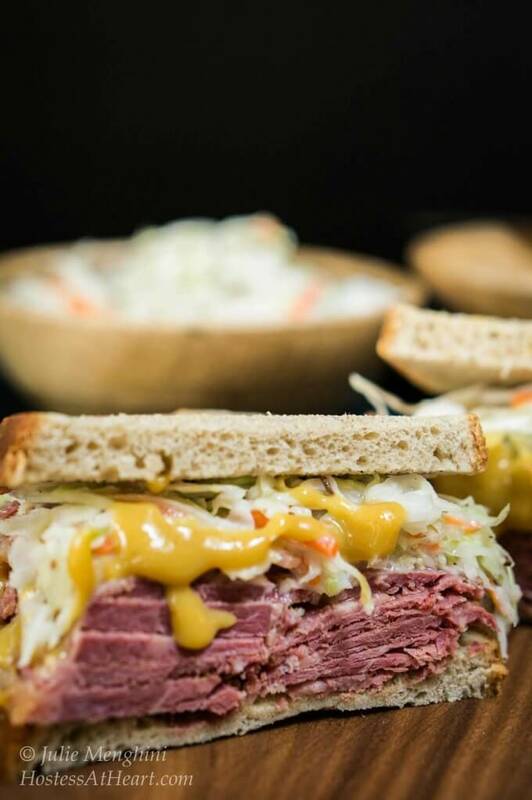 Corned Beef Cabbage Slaw Sandwich that’s slathered with a brown sugar mustard sauce and heaped with a creamy caraway slaw. Combine the sauce ingredients and whisk until smooth. In a small skillet, combine the mustard seed, allspice berries, and caraway seed. Heat until aromatic. Grind in a spice grinder and add to slaw ingredients. Spread sauce on both slices of bread. Add meat and top with slaw. Serve with additional sauce if desired. Ground spices may be substituted for whole seeds and berries. Nutritional values are for the slaw only since bread and the amount of meat you use can vary. If you love a great sandwich like we love a great sandwich here are a few that we love! OMG this is drool worthy! The slaw was out of this world delicious. 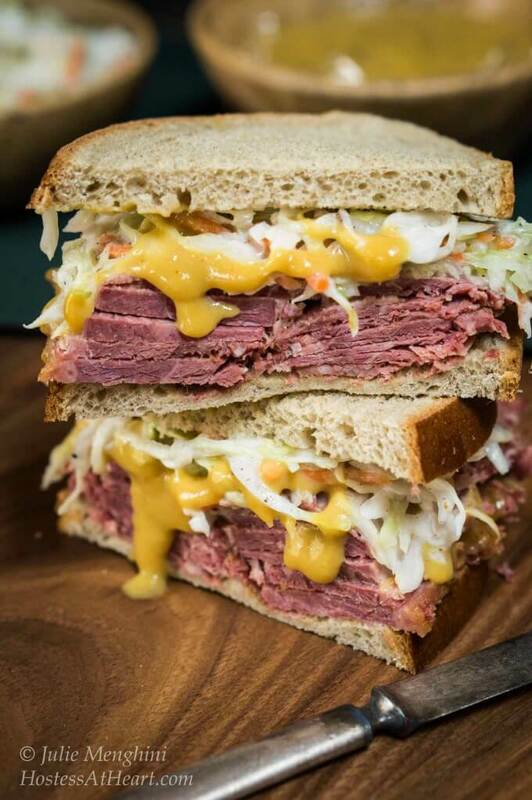 I will be making sure I always get the biggest corned beef so I can make this delicious sandwich. I had a ton of corned beef and made this slaw to go with it. Loved the greek yogurt and the tangy flavors it gave … it worked so well I know I’ll be using it a lot for some bbq’ing soon! Thank you, Michele! So glad you enjoyed it. I can’t wait to make some more. The combo of the cabbage and corned beef are so good I am licking my fingers clean! St. Patrick’s Day is just around the corner and I always make corned beef and cabbage. I know what I’ll be making with some of this year’s leftovers. Thank you, Karen! I hope you’ll let me know what you think. Absolutely perfect way to use leftover over corned beef! Thanks, I am definitely making this sandwich! 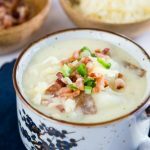 I love corned beef as well and am always so glad to have leftovers! This sandwich is amazing. The cabbage slaw is perfection. Ha! I buy an extra large corned beef for just that reason too – we’re two peas in a pod! I’m coming over to your house to enjoy this sandwich, most definitely – yum!!! That would be a dream visit my friend! Thank you! This sandwich is making me think that I need to prepare extra corned beef so I’m certain to have leftovers. The slaw sounds delightful. What a wonderful melody of flavors in this sammie! I have corned beef in my crock pot right now!! I sure hope we have leftovers so I can make this sandwich!! That slaw looks incredible!! Lucky girl! I’ll get a couple this week too! This looks like it may be the world’s best sandwich!!!! Thank you Brandi! We agree. Delicious! The ultimate St. Patrick’s Day meal! 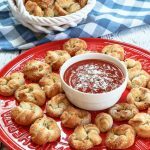 I made these for dinner last night and everyone loved them! I will definitely be making them again for St. Patrick’s Day! Thank you, Tayler! I hope you loved them like we did! Thank you, Petra! Sometimes the leftovers are just as fun as the original meal. Thank you for bringing this to Fiesta Friday! My husband adores corned beef sandwiches, his mouth was watering at your pictures! They do make great leftovers…corned beef hash anyone? Thank you Liz! I love corned beef hash! I’ve got one for the oven tomorrow and will have to plan on making some now that I’m craving it. Thank you so much for co-hosting FF this week too! Thank you Meggan. It’s done very well for me. Will you share your project when you’re finished so we can share back? I don’t really have anything to share back. I’m basically loading up a secret board with some outstanding burger and sandwich pins, and one per day will go out to a massive group board I belong to for burgers and sandwiches. 🙂 That’s basically it. 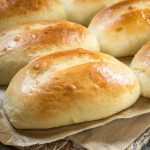 So it’s not a roundup, I was just looking for beautiful recipes to share. I hope that is okay. If not just let me know! I hope you see some Pinterest activity from it. I will appreciate the shares. Thanks Meggan! Thank you so much Martin! Please let me know how the sous vide turns out! I have one and am always looking for new recipes. I bet it would be marvelous. How long will you cook it? I just showed these to my husband and his jaw dropped 😀 They look fantastic, all those gorgeous layers! Thank you for sharing at Fiesta Friday!! Awe Naina thank you for sharing. This sandwich was a favorite with the boys for sure! You had me at cabbage slaw. That looks so good I think I could eat it without the corned beef!!! Your photos make it all look so good! Awe thank you so much Jenny! I agree with you too! Holy moly, this looks good! Corned beef was the first thing I ever cooked by myself (years ago), so it has a special place in my heart. Can’t wait to try this! Thank you Cathy! Loved you stopping by. This sammie is delicious and I hope you think so too. Stop back and let me know what you think. Lots of beef and mustard, just the way I love it. Thanks for making me want to eat right off the screen. Mmmm this looks so good! Definitely going to try this. Thank you Lucy! We really enjoyed it and hope you will too. If you get a chance, let me know what you think! St. Pat’s Day caught me off guard this year! The leftovers for a reuben was always my favorite party. Your slaw sounds very tasty! Thank you Judi! We don’t celebrate it with the exception of cooking our yearly corned beef and cabbage. It gets way to crazy out there for us. Lots of drunks on the road. A very tasty looking sandwich! Thank you Loretta! We loved corned beef but only make it about once a year and that is probably as much St Patrick celebrating we do. Oh maybe a Guinness too! Have a great week Loretta! Thank you Jeff! I appreciate your stopping by! Still looks delicious! The spices and yogurt in the slaw sauce are so unexpected (at least to me, anyway). I bet they complement the corned beef nicely. Thank you, my friend! I like this sauce because it’s smooth and not heavy. This sandwich looks tasty and easy to make. Stumbling to share. Thank you so much for your support and share! Thank you Dawn! It’s easy and yummy. This would HANDS-DOWN be my favorite kind of sandwich before I turned vegan! My mouth is watering. It’s a beauty!!! Thank you! The slaw and mustard sauce would be yummy together on an alternative sandwich too Susan. This looks so good to me, Julie! I love reuben sandwiches, and it reminds me a little of those. The brown sugar mustard sauce sounds wonderful! Do you mind if I ask you how you cooked your corned beef? Thank you Shari! We love roasting our corned beef brisket. So many recipes recommend that you boil them. I just rinse them well, put some liquid in the bottom of a roaster and bake at 325 degrees F. Cover it to start and then remove the lid for a nice delicious crust. Thanks, Julie. Roasting sounds so much better than boiling! Happy Saint Patrick’s Day and keep on cooking! Thank you Ana! It is really good.